One of our favorite blogs that we follow is DemonLover's Books & More. (man candy - need we say more!! lol) Below are all the details. If you have a blog, you should definitely join!! Each participating blog will host their own giveaway. There is no requirement on the minimum or maximum value of your giveaway. It's up to you to decide. You can give away books, swags, amazon gift cards, or anything else you can think of that has to do with books. 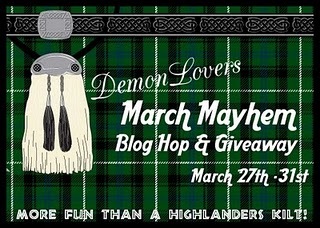 All participating blogs will be linked up through a DemonLover's Blog Hop/Giveaway linky. You will be given the linky code to add to your blog so that readers can jump from one giveaway to the next. Great giveaway. I'm a new GFC follower under Lucky47.Thanks for the chance. Love to read, Hope I win! !